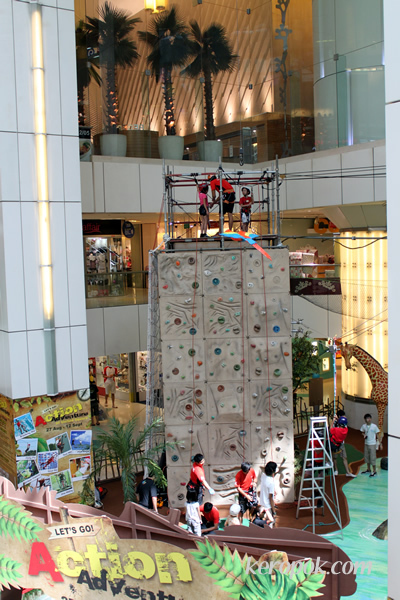 It was part of a promotion that allows kids 5 to 15 years old to climb if their parents spend x amount of money. What amazed all of us was this little girl. She was so small and looked like she's probably only three! But she sure was brave! I would not have dared to climb when I was five! We overheard this girl's parent talking to other parents. They were asking if she was already 5 as she looked so small, she was! 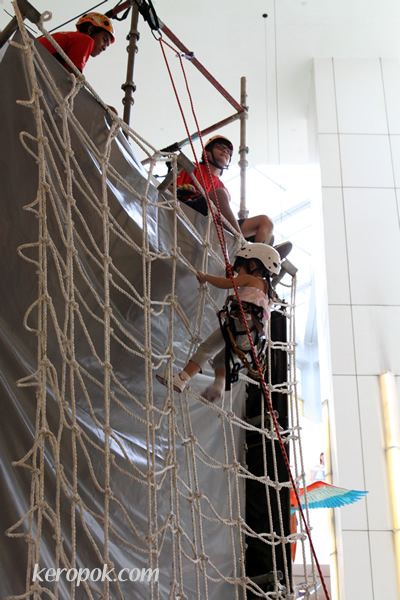 Her mum was terrified that the little girl wanted to climb. But let her do it after countless bugging. Mind you, it was very high! The robes part was on the side of this 1.5 storey high structure. 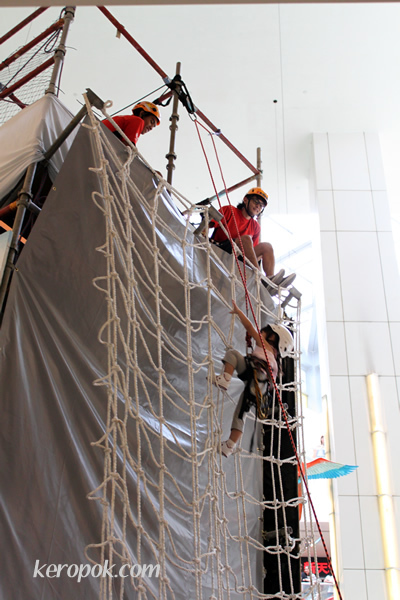 This side shows the rock climbing part of climbing up the structure. Kids nowadays have become very brave don't you think? Pardon the language today, but I saw this a few days ago and thought it was hilarious! 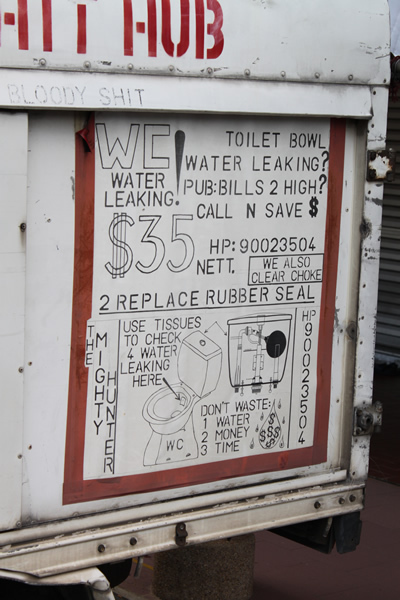 I am sure you will agree with me that this traveling toilet repairman is quite innovative! 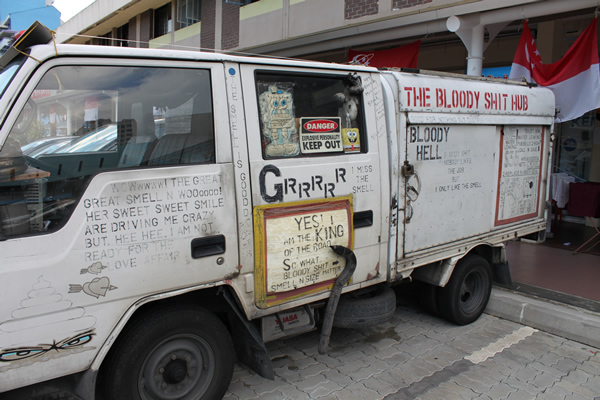 Everyone who saw this 'lorry' stopped to take a second look. So did I. For me, I even took out my camera and started snapping photos! 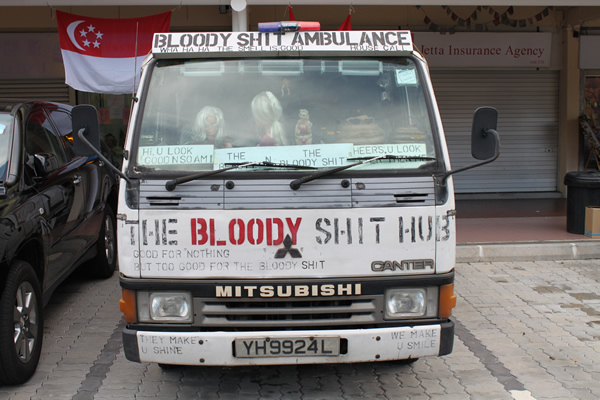 It was just fun reading what is written all over the mini lorry. On this side, there's even a piece of 's? ?t' dangling on the side! 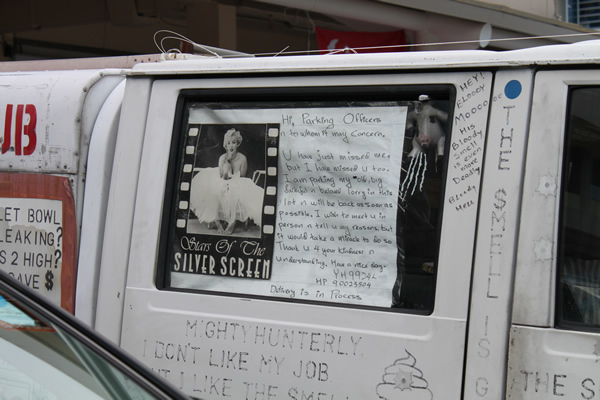 There's even a note for the Parking Officers. I wonder if any parking officer has given him a fine! 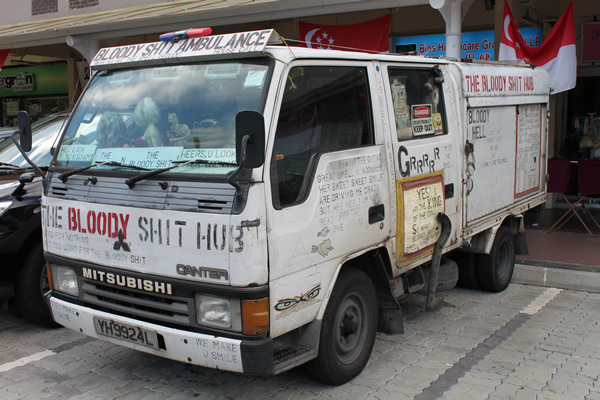 So who do you look for the next time your dear toilet needs some 'help'? It's the closing ceremony for the Youth Olympic Games tonight. 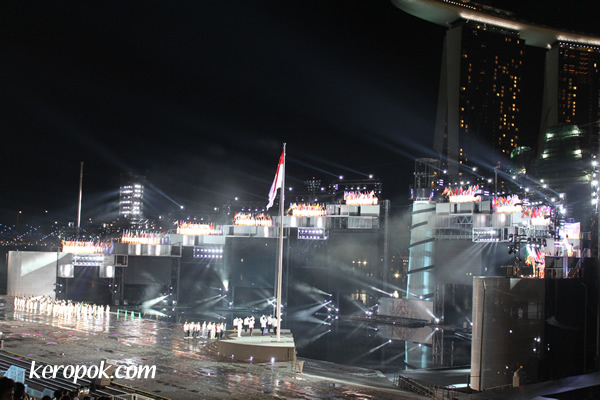 The Olympic Flame for the Singapore 2010 Games will be extinguished during the ceremony. I realized I have not seen the flames at the venue. So I took leave today off work to go take a look. 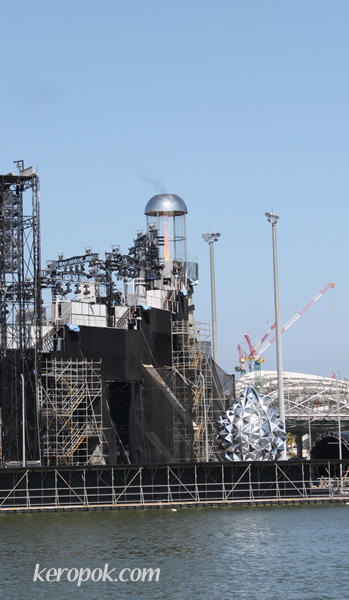 It's not a good day to go near the Floating Platform today. Security is so tight for the ceremony tonight. All routes are blocked. 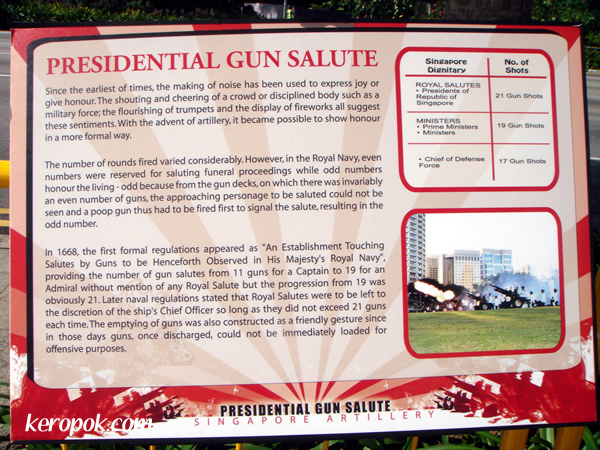 I could only get to see it from the Esplanade. Well, good enough I guess. Two weeks are over so fast! Everyone is a winner at the Games! 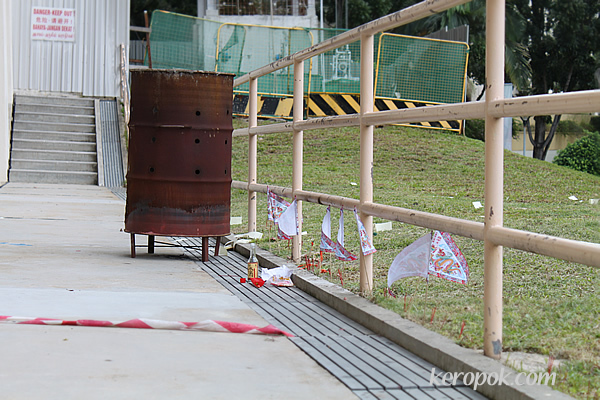 All around Singapore, if you have neighbors who believe in ghosts and spirits, they are burning joss papers in rusty oil drums like this one below. They also offer food by just leave them everywhere and it creates a mess when stray animals come and eat them. Neighbors are choking with the smoke entering their houses. Many have resorted to closing their windows and turning on their air-conditioning to breathe! Can't there be a more environmentally friendly way of doing it without causing so much air pollution? Electronic way perhaps? If they can now tweet messages to the Wailing Wall, can't they tweet to the 'gates of hell'? 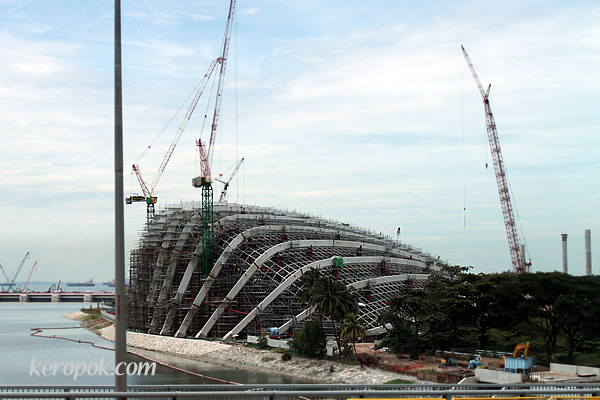 Have you seen this structure near Marina Barrage when you pass by the East Coast Parkway (ECP)? It's the Gardens by the Bay, Conservatory Complex. Part of the Bay South portion of the garden is the 2 conservatories, a cool dry and a cool moist. How interesting eh? I would love to see the temperate plants that they would be planting there! 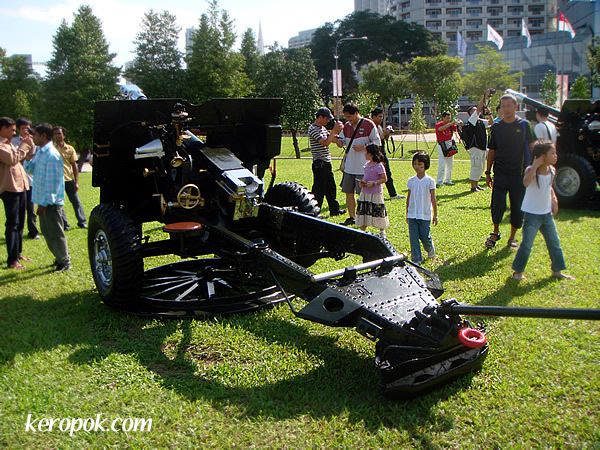 If you want to read more about it, click on to the NParks website here. Are you grow plants at home? Update: My brother just told me the photo above is the Cool Dry Moist conservatory. 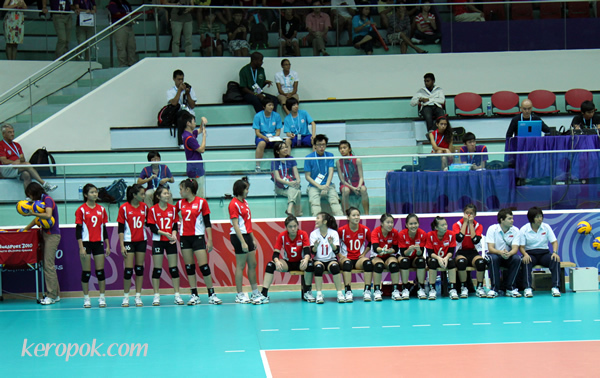 I was at the Toa Payoh Sports Hall during the weekend to catch a glimpse of the Volleyball game between Peru and Singapore. Just at the same complex, there's the Toa Payoh Swimming Complex. It's the the Aquatics - Diving event is held. 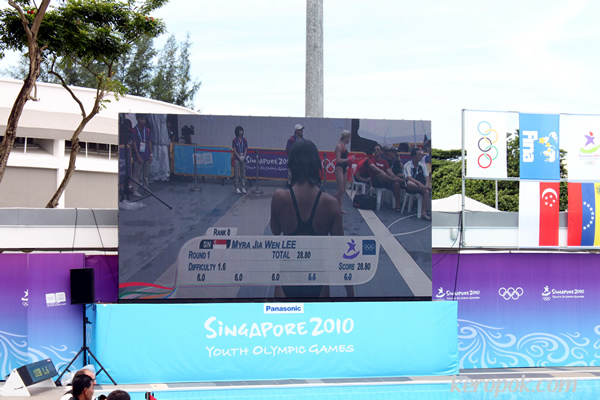 This was Myra Lee of Singapore. Let's also give her more time, she is after all so young. But I was quite impressed with China, Malaysia and North Korea's divers! They were good!! 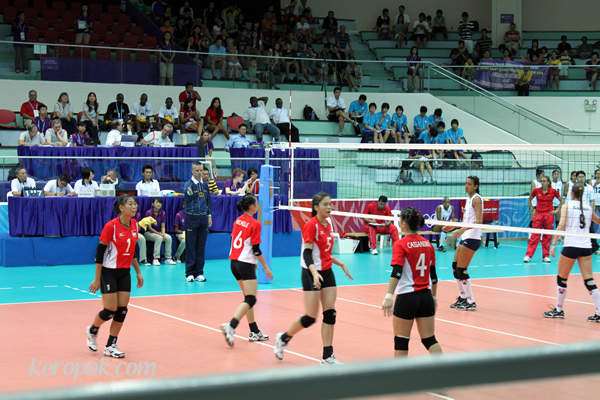 It was quite fun watching the games live at the venue. But it's quite warm as well. Bring your shades! Good thing the finals were held during the night. I heard it's the first night diving in the Olympics. p/s You also get to view on the big screen what viewers at home see on the TV! The Games are coming to an end soon. The TV at home has been tuning in to the YOG Channels. Have you been catching the event live or on TV? 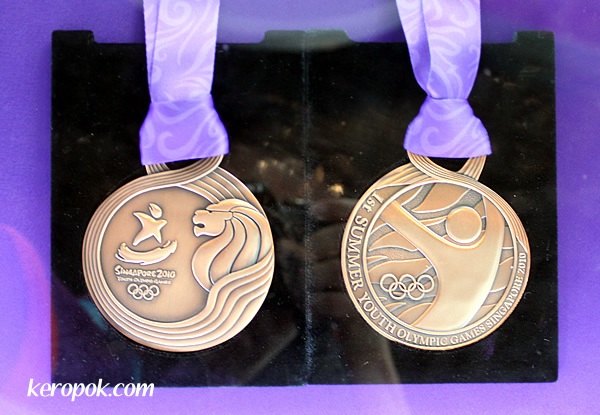 You want to see the YOG Medals up close? 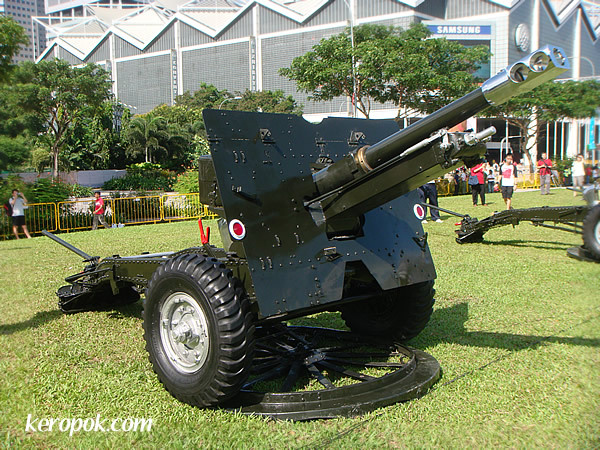 I saw it at the International Convention Centre, Level 3. I am not sure if it's the real medal or the replica, but there was a security guard nearby, so maybe it's the real thing. This is the Gold Medal. I like the design, do you? I like the side that has the 1st Summer Youth Olympic Games. The silver medal did not come out clear on my camera. 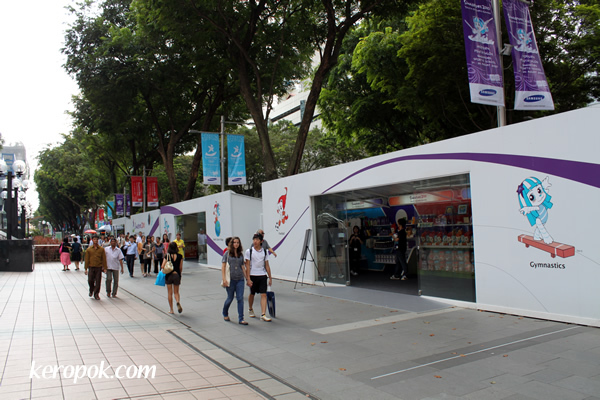 If you thought they were designed in Singapore like me, we were wrong. Reading the below will tell you the story. 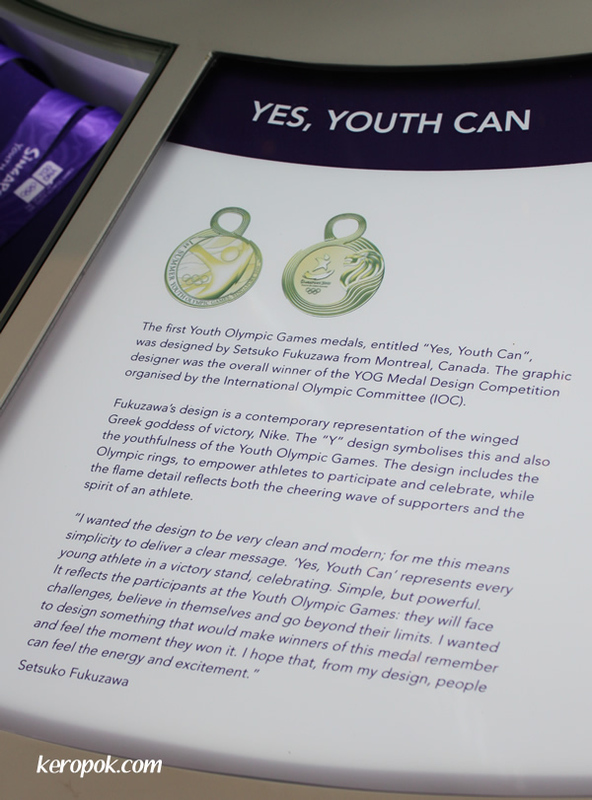 The medals are entitled "Yes, Youth Can". Designed by Setsuko Fukuzawa from Montreal, Canada. Go take a peek at the medals upclose. 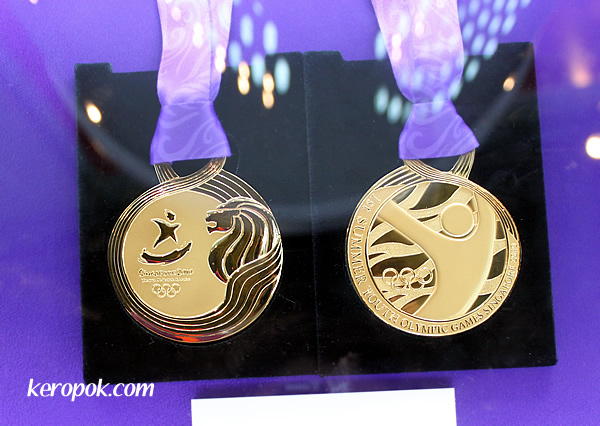 While there, you can also take a look at Singapore's medals from the Beijing Olympics too. 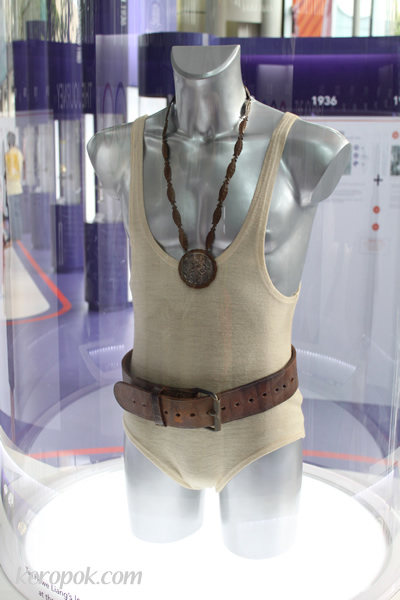 And also Singapore's 1960 Rome Olympics. The Olympics is not only about the athletes who compete and learn more about other cultures. It's also about the officials from the IOC (International Olympic Council), the various National Olympic Councils and all the different sports International Federations (eg, FIFA being one of the famous ones, International Sailing Federation, International Weightlifting Federations etc) These folks accredit the athletes so that they can participate representing their countries and sports and also play according to the rules. But the most important people would be the Volunteers! Without them, how can the games even operate. 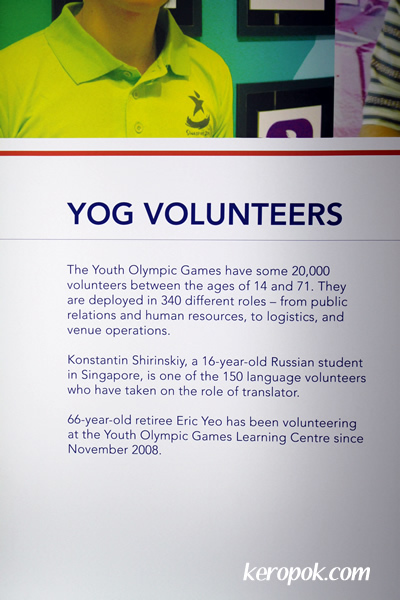 In the Singapore Youth Olympic Games, there are over 20,000 volunteers! But there are many volunteers who genuinely want to help. 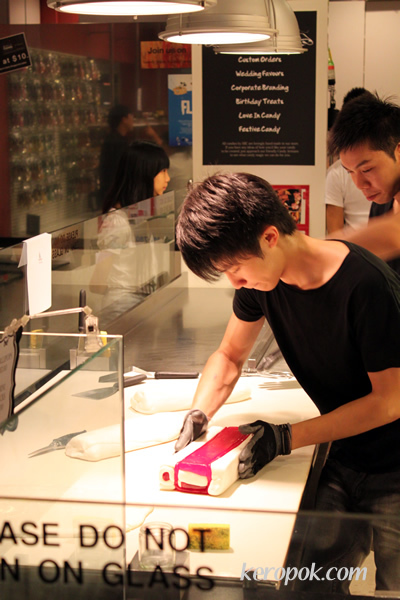 They use up their precious annual leave so that they can volunteer. They also have to burn away their weekends attending the various protocol, etiquette and many other training. They meet up to do menial stuff like packing welcome packs etc for officials and athletes. 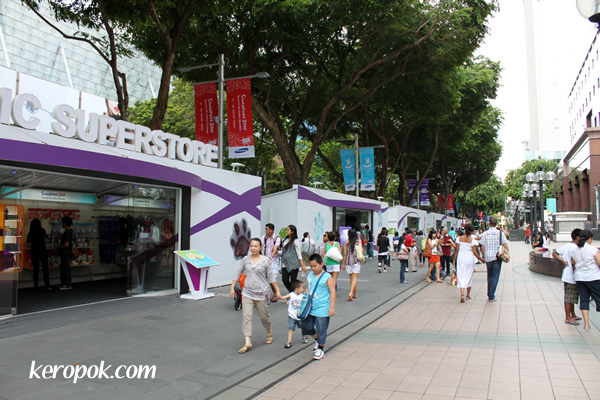 They do research about other countries so that they know to welcome their visitors and make them feel at home right here in Singapore. Here are two examples of the volunteers. Whether you are 16 or 66 years old, you can contribute to make the Games a success. To the complainers, complaining doesn't help. Do something and help! Lift your fingers to do something, not to type your complain letters. Use your brain to think how to improve things and not to think of everything nasty. 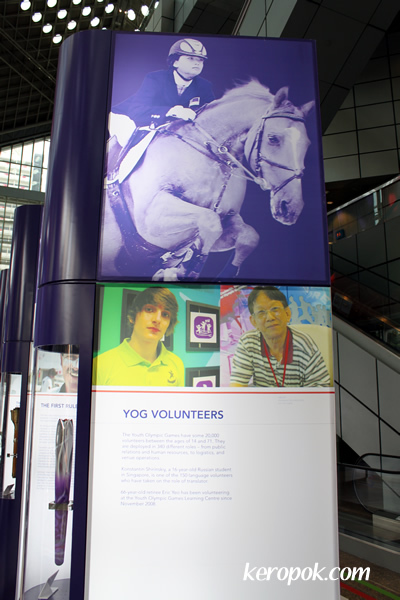 To all the genuine YOG Volunteers, you are doing a great job! When you see the smiles and appreciation of all athletes and officials that you serve, it's all worth it, ain't it? A new habit for many these days during lunch time. 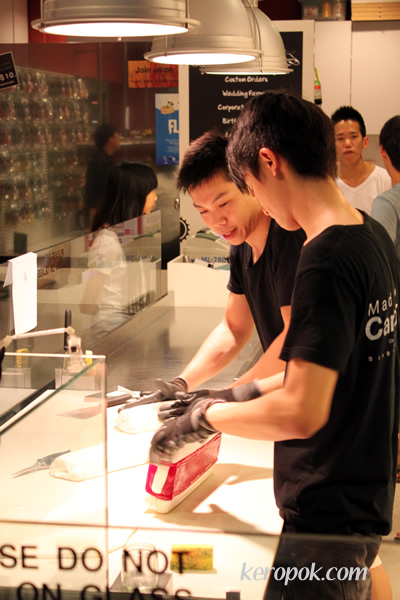 Flipping out mobile phones to watch the Youth Olympic Games! For different phones, you access it differently. For my phone, I view it via the iPhone App provided by the telco. I am surprised it is so clear and fast. It drains your battery, so bring along a battery pack! What's your must watch event? Well, I guess I am one obedient boy and waited till today, two days after the real thing have passed before I posted anything. Did you all enjoy the Opening Ceremony? I did! In fact, watching the real thing on television on High Definition was better! 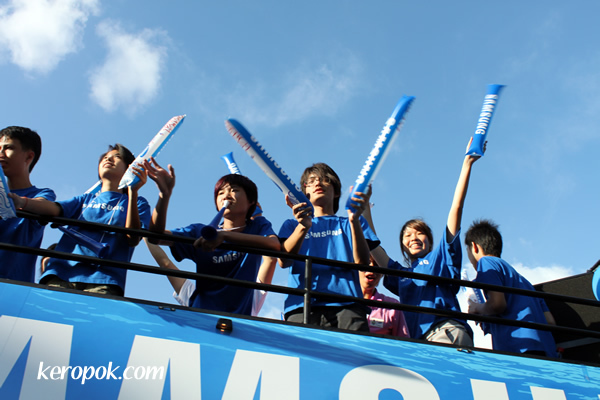 On TV, we would see up close the facial expressions and view the event from different angle as the camera changes from one to another. But we could not feel the 'energy' if you were physically there. I was so glad I had two options to watch it on TV. There was a free-to-air broadcast and a cable company's broadcast. Overall, it was great! I loved the lighting of the Olympic Flame! 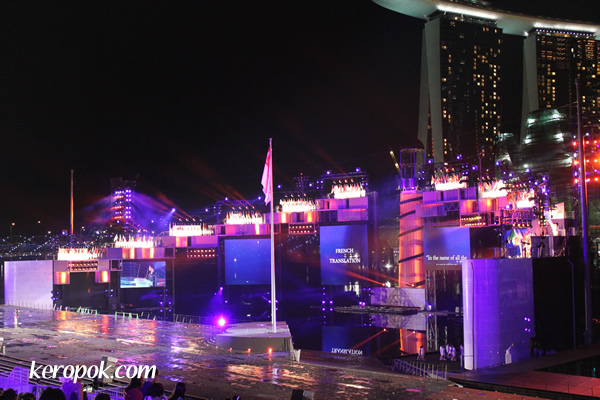 It suddenly daunt on me that Singapore's an Olympic City! We have known it for some time we are hosting it, but it just did not sink in until everything is up and ready to welcome visitors. 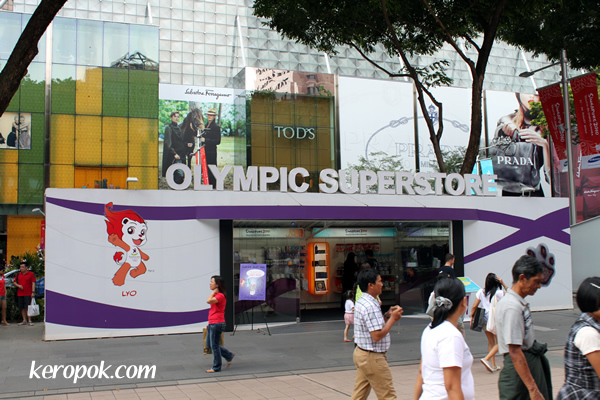 You can see the Olympic Merchandise is sold right in front of Salvatore Ferragamo, Tod's and Prada! Why do they call it the superstore? Is it because it is very long? By the way, the things sold in all the tents seems to be repeated to me. Don't miss out the Opening Ceremony tomorrow! It was so exciting. 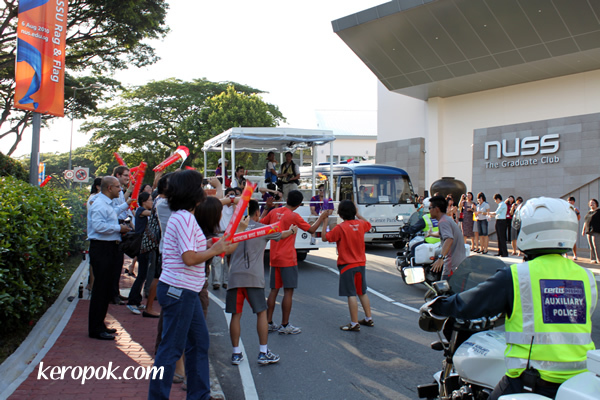 When the Youth Olympic Flame passes by where you live or work, you will want to drop what you were doing and join in the excitement. That was what my colleagues and I did. 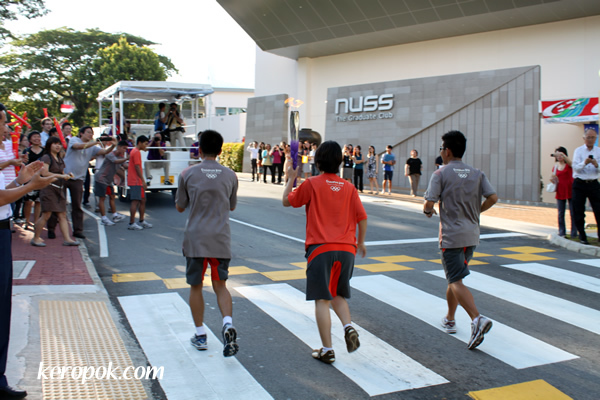 It's one of the rare opportunity that you will get to see the flame in person and not from the newspaper or TV. The flame had traveled all the way from Greece! When was the last time we were so energetic? Their youthfulness and energy do rub on to the crowd! 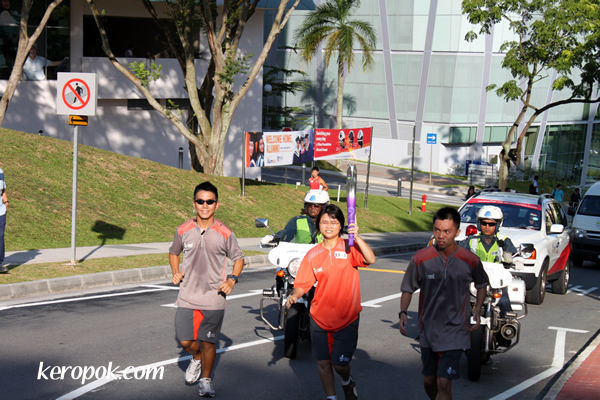 The first torch bearer in NUS grounds. This was Ms Lyhor Nalene. 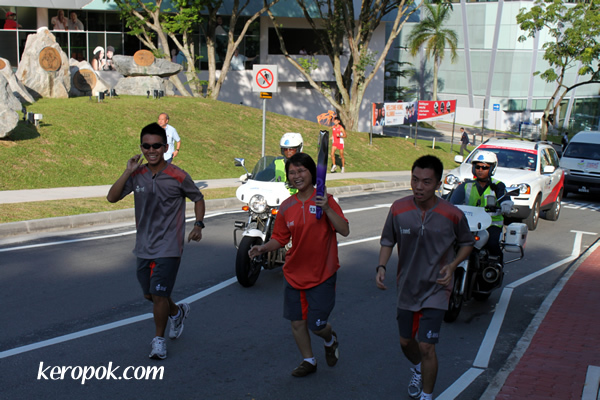 If you can't see the flame in the bright sun light, here's the photo when the runners are in the shade. She looked so excited! You would too ya? She got one of the tough leg. Her run just before this stretch was all uphill! 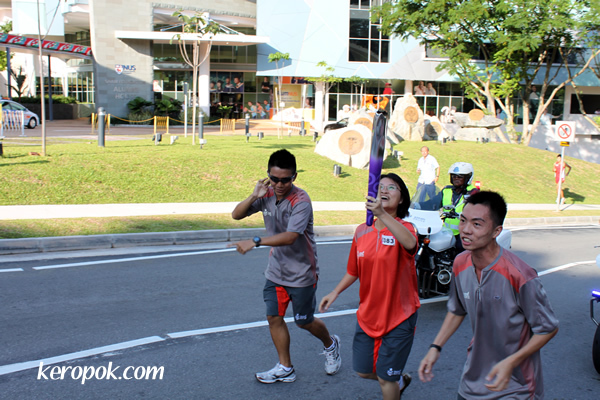 She's running towards the next torch bearer. The flame was passed to Chen Litai Jeremiah. This was where they posed for photos. What's your dream? 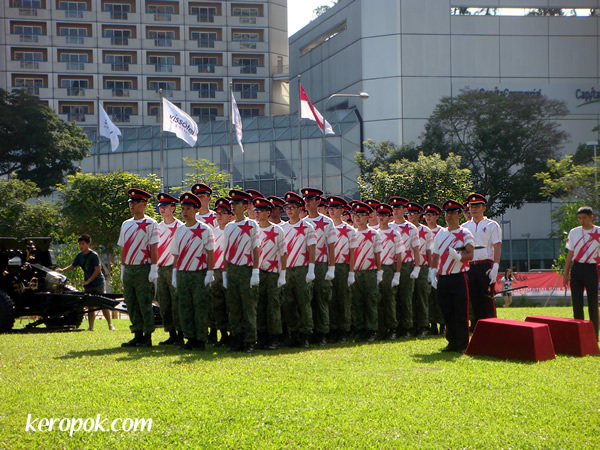 This year for Singapore National's Day, the theme is "Live our dreams, fly our flag". 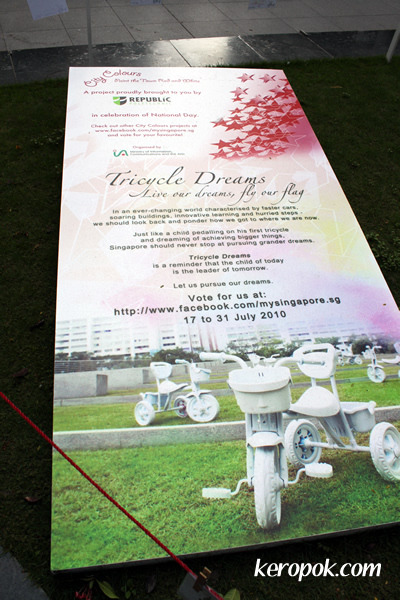 To dream the theme, you see many projects or displays around Singapore that follows the theme. 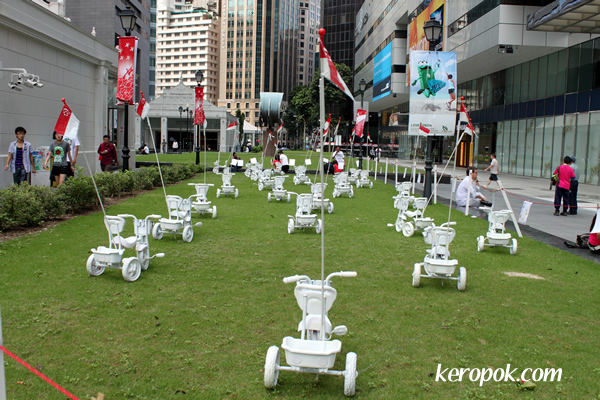 I saw this Tricycle Dream display at Raffles Place recently. Small little white tricycles were everywhere. Each having a Singapore flag on it. It's kinda cute. 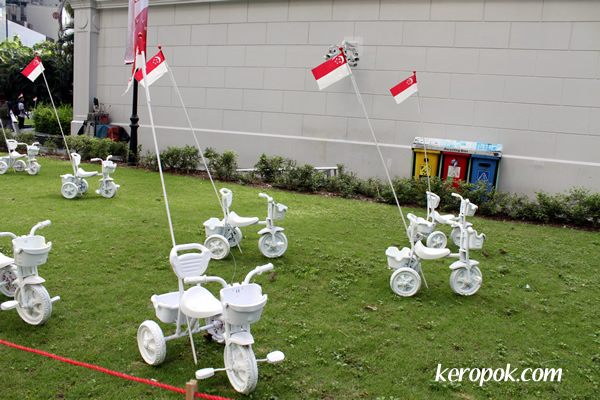 It's suppose to remind us that we should encourage the little ones to peddle on, and dream big! My sis said to me: "Do you realise something? Everything is facing one direction. Everything is so systematic." We need some chaos to spice things up! Surround the tricycles were little drawings by the little kids of their dreams. 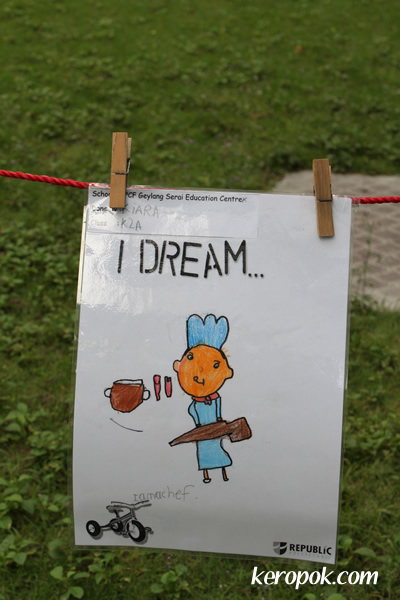 The dreams of 80% of the kids are of the same profession. I don't need to mention it, you would have guessed it. 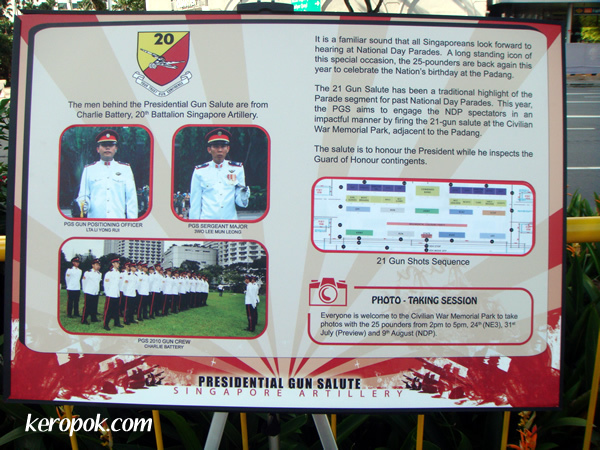 This is Singapore, parents use a template to tell kids what to be when they grow up. But there are a few different ones that I spotted. Let me show you three. This little one, Kiara who wants to be a chef! Let's wish this kid success and one day, may you have yourself a Michelin Star restaurant in Singapore! 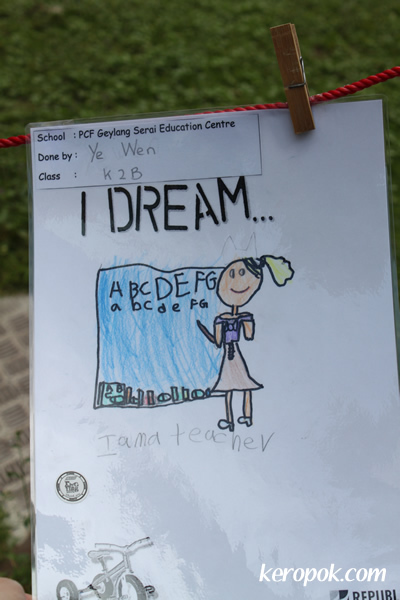 Ye Wen wants to be a teacher. A very noble dream. In Singapore, most teachers have to be at school by 7:20 AM and most leave work only after 5:00 PM because of extra curricula activities. A really tough job. Ye Wen probably does not know that yet. Let's hope when he becomes a teacher, things will be better! This was interesting. 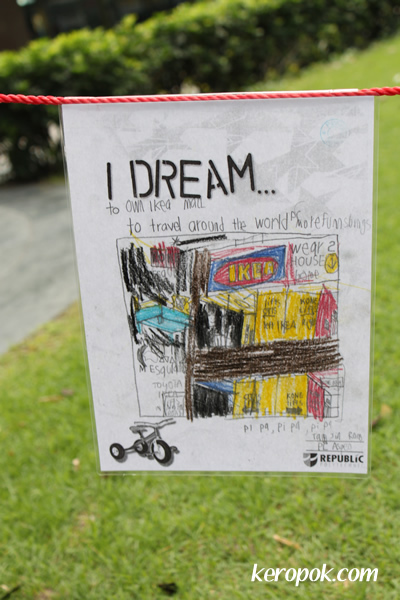 This kid's dream dream is to own Ikea Mall! I wonder if he spends his weekends at Ikea every week? I am an Ikea fan too! Let me introduce you to: http://www.ikeafans.com!! 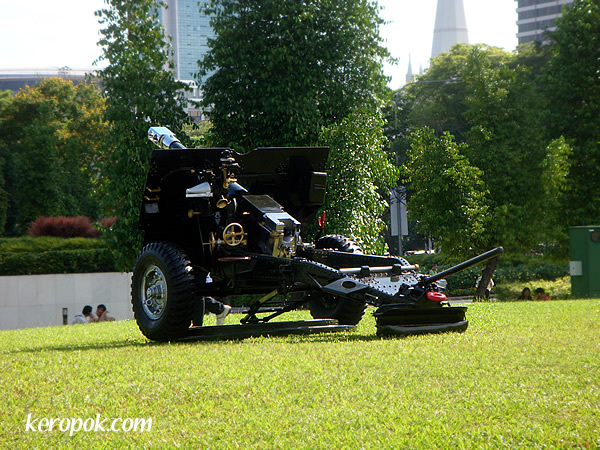 Wishing all Singaporean readers a very Happy National Day 2010. 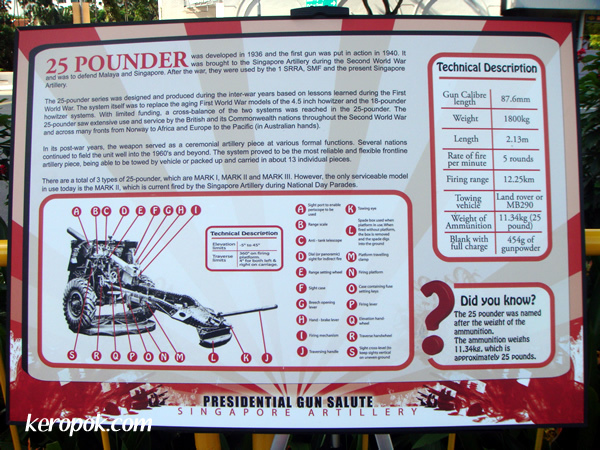 Today's photos are all about the Presidential Gun Salute.